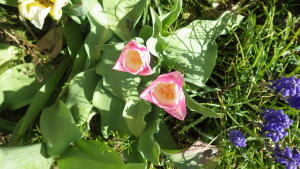 As Spring continues to unfold, we welcome the next round of color….pink and red. The trees all over our county are beginning to bloom: weeping cherries, magnolias, peaches, redbuds, flowering crabs…a feast for the eyes. 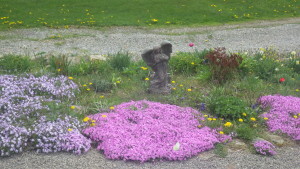 On Big Oak Ridge, we are experiencing our own flavor of pink…creeping phlox fills the front flower beds with mounds of color. 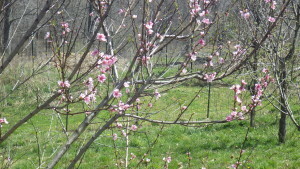 The peach trees are blooming-even the one we thought we lost to the hard freeze last winter. These are the trees we grew from peach pits a few years ago. We are hoping that they will produce peaches again. 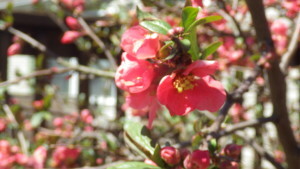 The flowering quince is beautiful this year. It is filled with the sound buzzing bees and singing birds. A welcome backdrop to our breakfasts on the front deck. 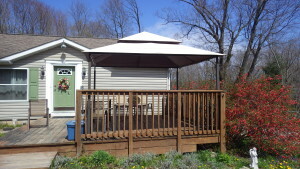 Once the weather begins to break, we seldom eat indoors: we prefer to eat outside and enjoy our flowers. 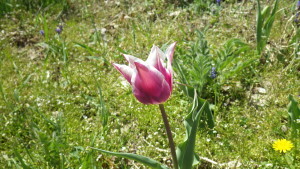 We have tulips of every color but some of the new ones are unusual shapes and colors. It’s no wonder that the full moon this month was called the “pink moon.” So many shades of pink and red. We are loving the palette of Spring. What is your favorite color? We can’t decide. Spring continues to unfold on Big Oak Ridge; each day brings new color and changes in the fields and gardens. We relish the freshness and beauty of the season. 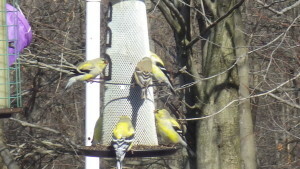 The finches are fully yellow and a few orioles have been spotted in the neighborhood. Each dawn we are greeted by the chorus of birds and each evening we are lulled to sleep by a symphony of frogs. This week the purple has started to flourish. 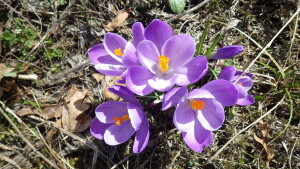 The first purple of the season happened a few weeks ago with the appearance of crocuses.. dainty and short-lived, but always our first glimpse of color and hope for the beginning of warmer days. 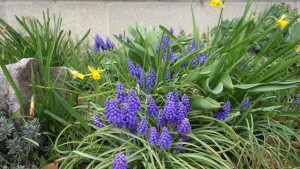 The beds around the house are full of grape hyacinths…from a bunch of 25 bulbs I purchased a few years ago, we are polluted with little purple clusters. I have torn them out by the bucketfuls in years past and it only seems to make them stronger. 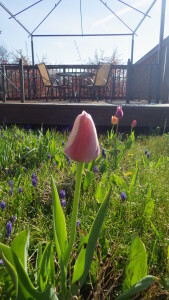 Not that I mind their cheerful color, but they tend to choke out the tulips that are just starting to open. 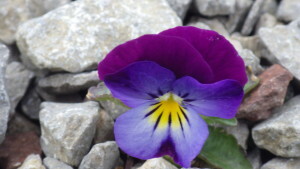 Popping up among the edges of the walkways are tiny violas. For some reason they love to hide their wee seeds in the gravel. We love their happy little faces, don’t you? We have one larger hyacinth that came from a pot that I got for Easter a few years ago. 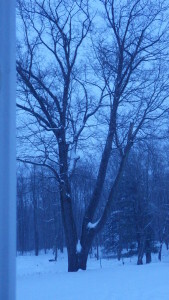 It was not very large this year because we had an unexpected snowfall of five inches and it got set back a little. 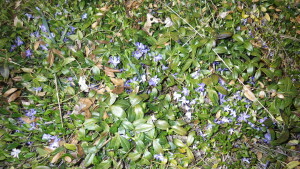 Nestled among glossy vines are star-shaped Creeping Myrtle. 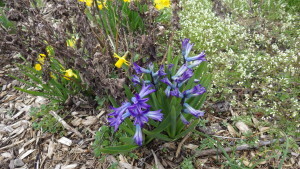 These hardy perennials stay green all year and grace the roadside along Bowman Road. We harvested a few starts for along the top of the retaining wall and they are slowly covering the bank and infiltrating the flowerbeds. 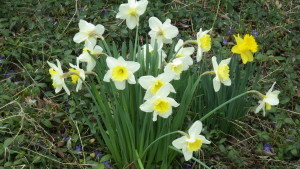 We are enjoying the palette of Spring this year. 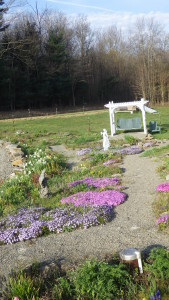 We hope you are enjoying this pictorial and colorful tour of our flowerbeds. Stay tuned as each color emerges and each new blossom unfolds. 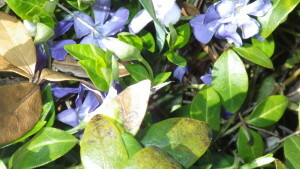 I love spring and all of the newly emerging colors. This year I am focusing a post on each color. I started with green last month and promptly got sidelined with a nasty virus which took the air completely out of my sails. This month I will resume and hope to keep up with the changes. I love yellow! Next to green, it is my favorite color. 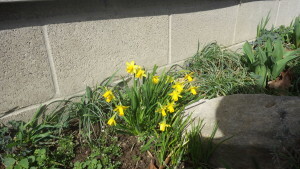 I especially love when the yellow begins to appear in the spring. A few weeks ago I began to notice patches of yellow beginning to appear on the 30-40 Goldfinches who frequent our feeders. 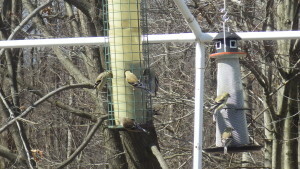 This year, since my feeders are closer to the window, I was able to see subtle changes in color between the various birds.. It has been fun to watch as they slowly change from winter to summer color. 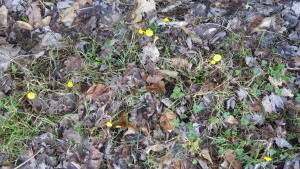 Among the first flowers to bloom are Colt’s Foot…my kids always called them Ditch Daisies because they always appear in the ditches along our dirt road. 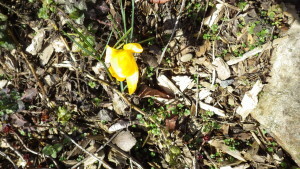 This year we even had a few yellow crocuses. Along the road, our neighbors have forsythia bushes…they are especially pretty this year since we had such a mild winter. I keep forgetting to take my camera along on our walks to get a photo. 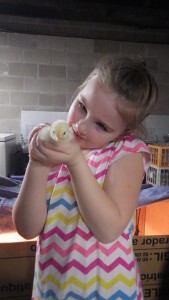 Finally…everyone’s favorite sign of spring…Chicks!! Ours arrived on Good Friday and the weather this past week and a half has been freezing…so they spent one chilly night in the coop and are now hanging out in our garage waiting for the warmer temperatures to return. I hope you enjoyed this week’s color…stayed tuned for the next color change. Almost St. Patrick’s Day and it’s starting to look green here. The grass is greening up and the trees are beginning to bud. 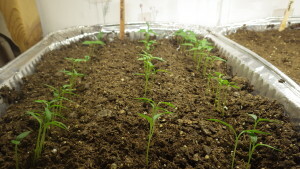 After a mild winter and early warm temperatures, we are itching to get things growing. 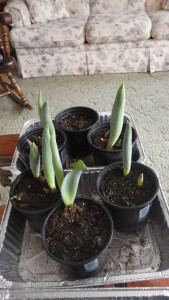 Kenton planted tulips in pots with two of our granddaughter’s a few weeks ago and they are getting really tall. 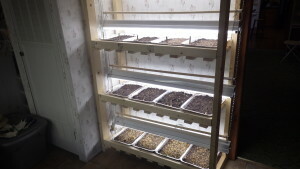 Last week we built a second grow rack…we customized this one a bit to fit the space in our utility room. I have quiet a few things started: tomatoes, basil, zinnias cabbage, broccoli, cauliflower, brussel sprouts, peppers and squashes. I can see some things starting to grow in the racks too. 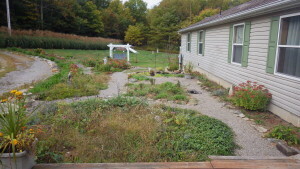 I also planted a few cold tolerant things outside. Kale, spinach, radishes and I even got brave and planted my peas. Now the push will be on for Kenton to complete garden #3 so that I have somewhere to put all of these seedlings. I realize that I have not been very diligent with my blogging…I tend to do the easy click Facebook stuff. I also vacillate between “too busy to blog” and “nothing happening to blog about.” I’ll try to do better this year. We haven’t had much snow this year…a few big storms that only lasted a couple of days and melted away quickly. It’s actually a nice break after last years’s frigid temperatures. Livestock care is also minimal this year. After a rough winter last year, we decided to sell the goats and not do large animals for the winter. When the goats left, we also had no need for an very active herd dog puppy….so Moshe left for a new home. 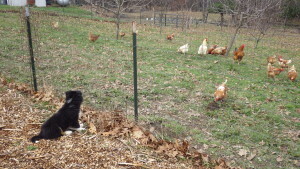 We only have 13 laying hens and that has been very manageable. This is the second of March and we got a bit more snow last night. We are expecting warmer weather this weekend so this probably won’t last long. I have chicks and turkeys ordered and my seed order is on the way. This week we will be working on cleaning both coops and fixing some issues with the large coop sinking. 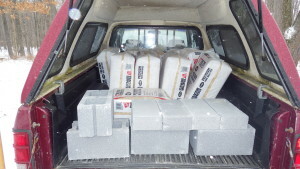 Over the weekend, we took the truck to get supplies for that project. Let the games begin!! It’s Finally “winter” in NWPA! In honor of the fact that we have 14 inches of snow as of Feb. 18 – the first “major” snow of the season at Big Oak Ridge… I finally got around to changing the header image. Nevermind that it will change again in just a few weeks – I’m not complaining! We have been “juicing” as part of our diet, and we’ve found that one of the challenging (and expensive) aspects of juicing in NW PA is adding fresh greens to the juice. It happens, however, that we had some very nice kale plants in the garden that were still producing nice, large leaves at the beginning of November. This fact, coupled with some unseasonably mild weather, gave us the “push” we needed to finally get some simple row covers going. We had some battens left over from siding our barn. 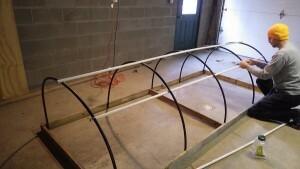 We cut two 10 foot lengths and three 4 foot lengths and screwed these together for the bottom of the frames. Next we cut lengths of 1/2 inch black plastic pipe for the ribs. and screwed those onto the base. We used 1/2 inch CPVC pipe (because it’s straight) for the spines, attaching the spine to the ribs with zip strips. 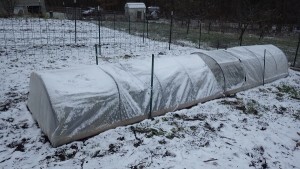 We built two of the 4′ x 10′ frames to start – enough to cover our remaining kale and our leeks. We had a lovely weekend. Last Friday I was at Home Depot looking at mums for a bit of color in the front flowerbeds and discovered a demo fountain at 1/2 off…I’ve had my eye on this fountain, but couldn’t swallow the price. 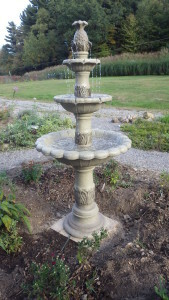 I have missed having a fountain and told Hubby that if they went on clearance this year, I was buying one. Demo price was even better than clearance, so I bought it!! 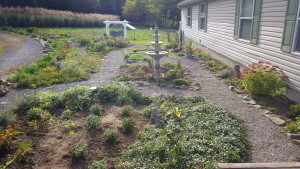 Our flowerbeds have been sadly neglected during harvest season so it took a bit of work to even find bare dirt. The mums aren’t blooming yet so it was hard to pick colors and I think I ended up with 8 out of 10 all the same color…oh well, it’s better than weeds. I realize it’s a bit late to put up a fountain, but we agreed that we would enjoy it for a month. We also strung some lights in our canopy and spent the evening watching the lunar eclipse. We had a great fall bike ride down the trail to the village of Brandon and back…about 22 miles. The leaves are starting to fall and the weather was perfect. No photos of that as we just enjoyed the ride. This time of year reminds me of family evenings when our kids were small. We are almost done with the harvest for this year. As always, some things did well, some things did not so well, but the freezer and larder are fairly full and we are just about ready to go into “hibernation.” It’s time to start getting ready for bed. We keep thinking of “just one more thing” we can do before we actually get tucked in though. Gone, too, is Moshe: a great dog in so many ways, but he needed more space and more animals to “herd” than we could provide. I hope he’s happy, herding cattle at his new home. Next year is looking like more birds, less four footed animals. 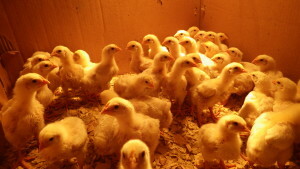 We plan to raise more meat chickens and maybe revisit the idea of getting a self-sustaining flock started. 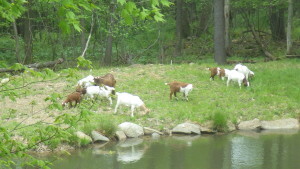 We will have to consider the pastures, though: with the goats gone there will be no one to keep the growth in check. We may yet end up with a cow, a llama, or some other herbivorous lawn mower/brush cutter/etc. It’s hard to believe that summer is winding down and kids are back in school. 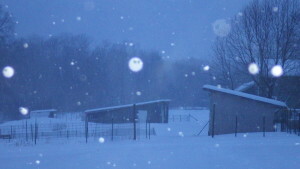 This has been a difficult year, it started out too cold, progressed to too wet and ended up too dry; never a good combination with gardening or livestock. With the thoughts of impending snow and colder temperatures,we decided to rethink our goals and priorities and came to the conclusion that we needed less responsibilities for the winter. After four months of “practicing” and attempting a house dog, we realized that we were not finding joy in the responsibilities and care involved in owning a dog. Moshe was a great dog, but he REALLY wanted to be a herd dog and run with cattle, so we searched for a new home for him and found a perfect fit. He is happy now and we are too. We also decided that it was time to free ourselves of our little goat herd. We LOVE goats and enjoy their antics and personalities, but the long and short of it is that they had become a burden and consumed vast amounts of our time and resources. Yesterday they moved to their new home. 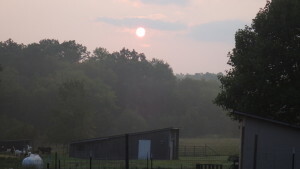 It will be very quiet around here but we are looking forward to being free to assist with homeschooling our grandkids, helping our daughter move and settle in a new state, and maybe even a bit of travel. Ecclesiastes 3:1 To everything the is a season and a time to every purpose under heaven.